At my *Faithful Fitness*class today, we played a little game to help us get to know each other better. So, when those of us with “dirty dishes” in our sink had to get up and move…I learned that maybe I’m not alone…but then I was impressed by those who had managed to clean either the night before or first thing in that morning. For years I told my husband that “if I were a good housekeeper too, then I’d be perfect, and that’s just not achievable, I mean we all have to have a flaw right?” (smile)…but after 15 years, the cuteness and charm of that comment has worn off. It’s time for change…can I do it??? So, I’ve decided it’s time for a fresh start. I read up a little to see how others do things. I think part of my problem was I had one laundry day. One full day of doing something I don’t enjoy. Over…and over….and over. Load after load after load. I would put it on the back burner, allow myself to be distracted and forget. I’ve learned that some folks break it up in the week it’s not as bad! My game plan is to have 2-3 laundry days, so I can stay on top of it (hopefully). We recently hosted a party celebrating my son’s first birthday. (Pictures/blog to come soon) And while preparing, we kept coming across pesky things to clean that we never really think about. Such as wiping down things in the laundry room, cleaning windows, scrubbing the frig etc etc etc…it took us much longer to prepare because, well, I don’t do these chores on a regular basis. 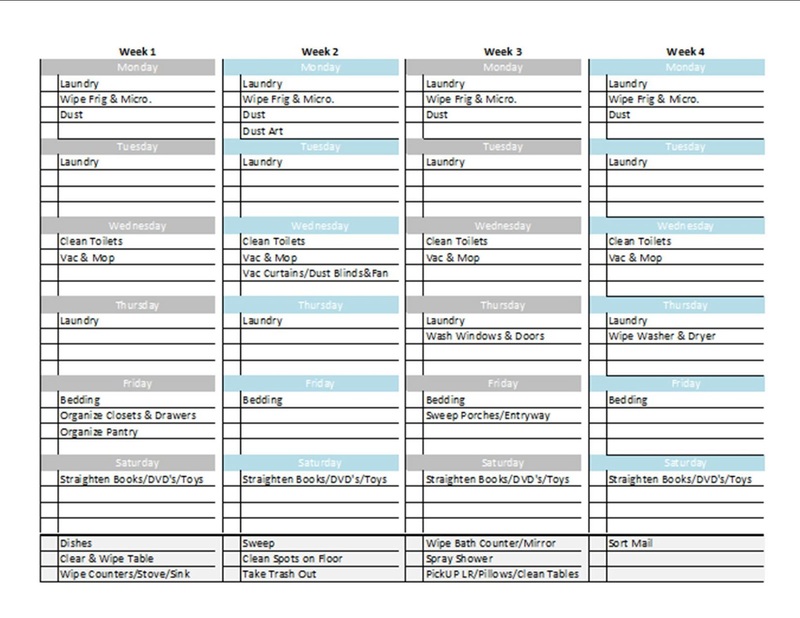 After my research, I’ve put together a chart with daily, weekly, and monthly things to help keep me on track with our home. When you have kids, a business, and hobbies; cleaning is such a pain.